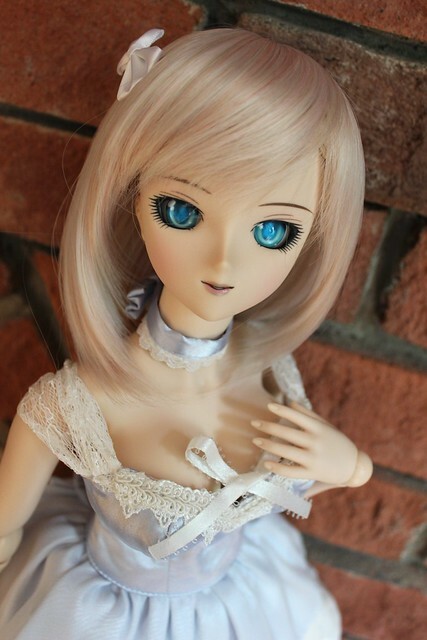 Several weeks ago I had the lovely Volks Dollfie Dream Natsuki pass through my home before I sent her off to her her owner in California – A.Z. 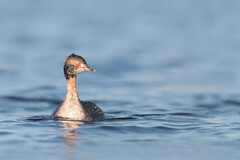 She arrived very quickly and her new papa sent me some lovely photos of her once she was settled in. Here’s Natsuki before I packed her up to go on her adventure! Hinata recently was upgraded from her DD2 body to the DDdy3 body and wanted to wear the lovely new dress to showcase her new assets. 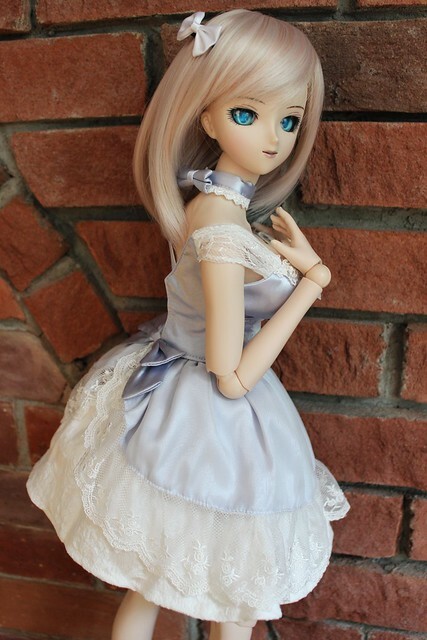 The dress she’s wearing is the “Something Blue Wedding Dress” from the recent Volks Dolpa in Sendai, Japan. It came with the dress, choker arm covers, lovely white thigh-high stockings with white lace trim, and a veil. I rather like the dress just on it’s own as a pretty tea dress – it reminds me of the beautiful silhouette that dresses had in the 1950’s at the height of the Christian Dior “New Style.” I think the next time Hinata wears this, she needs some pearls and a lovely hat! The dress is actually three separate pieces – the bodice (which is lined in white), an underskirt made of a white brocade-like fabric (that has a layer of soft tulle built in for a bit more puffiness) and the overskirt, which has the lovely blue fabric with a sheer white chiffon layer over it and the lovely lace trim. Since the overskirt isn’t attached, it can be worn so that the bow is at the front, back or off to one side. 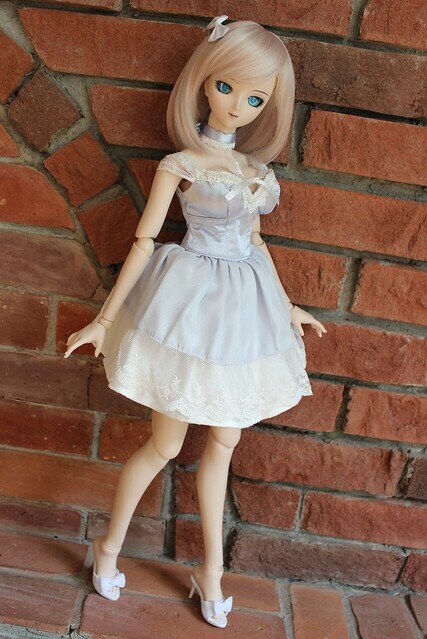 For collectors who own the Volks “Sugar Milk Cookie” outfit from Kyoto 9, the blue to this dress is a little bit lighter. It isn’t nearly as bright as the “Alice Maid” set. 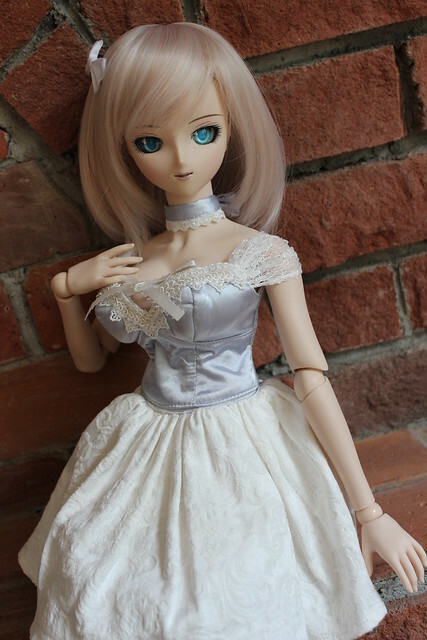 Here Hinata is wearing just the bodice and the white brocade skirt to show the lovely texture of the fabric. I’ve already got a few mix-and-match outfits in mind for this lovely white skirt. I was drawn to this lovely dress because once I looked past the “Bridal accessories” that it came with, I saw a very lovely cocktail dress. I think Hinata looks very lovely in blue, don’t you? Moe & Paw go out for breakfast! 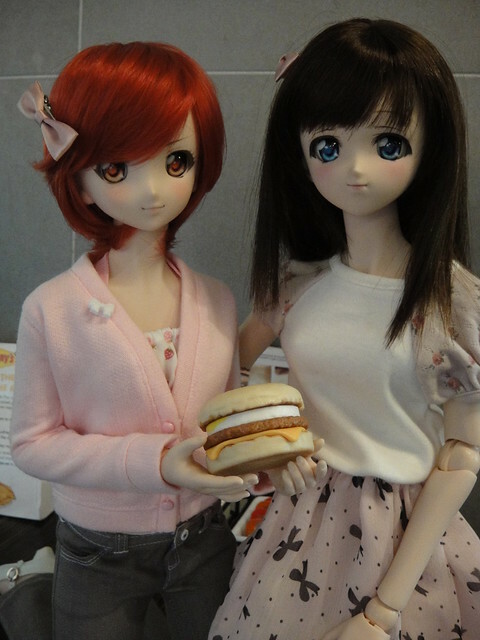 The girls had a big breakfast sandwich to share too! 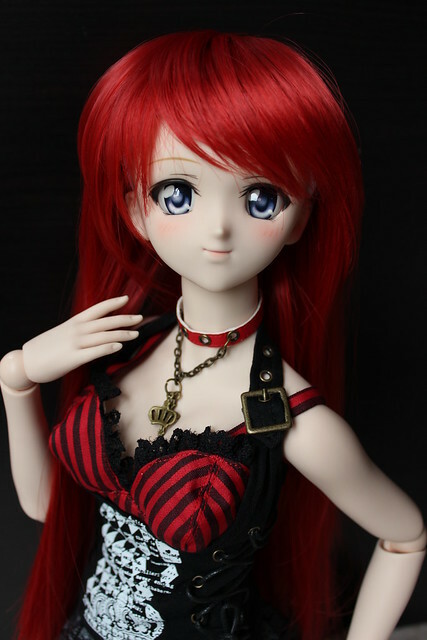 I’ve currently got a Dollfie Dream Mio visiting at my house – and I was given permission by new owner to take her out to play today. I don’t know anything about the K-ON series, and didn’t care much for Mio’s default wig so I tried some other looks on her. 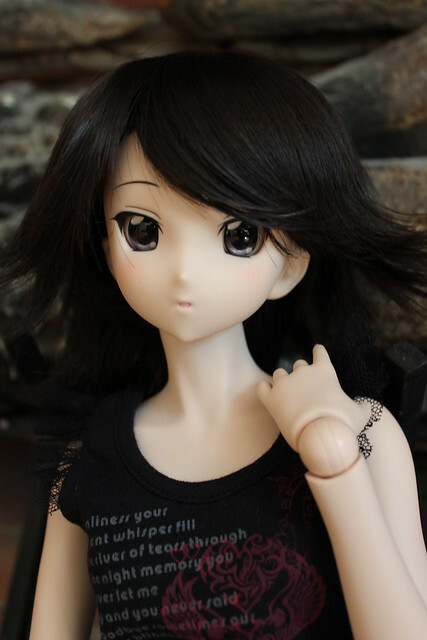 This is one of the wigs Rin usually wears, and it gives Mio a tom-boyish look. There’s something about her open-mouthed sculpt that makes her look perpetually hungry, even when she’s just lounging around. Annalise had quite the jet-setting weekend! No sooner had she arrived home from her visit in Vancouver that I packed her into another suitcase and off we went to London, UK! I met up with fransgaard, GabrielVH, Jezatron, cookiedude_2332, Pink_Blaise and JRuzzy on Monday evening, at The Light Bar in Shoreditch for drinks and dinner. 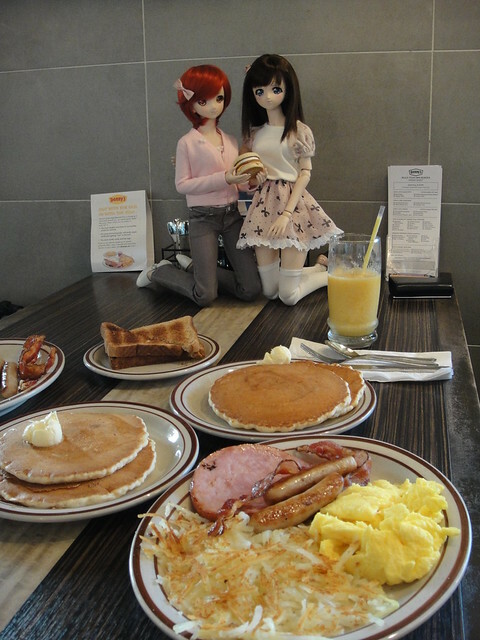 GabrielVH and I had brought Dollfie Dreams with us to our last outing in July, but the restaurant was very small and crowded so our girls didn’t get to come out of their bags! This time fransgaard helped us pick a more spacious location and the venue was actually fantastic. Fransgaard picked the Light Bar because I had mentioned that a space with lots of natural light would be fantastic, but the time we brought out our DD’s it had gotten dark! 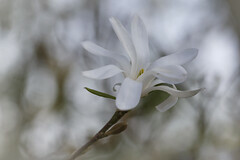 >__<” My little point-and-shoot camera is awful at night so I didn’t take a many photos as I would have liked. 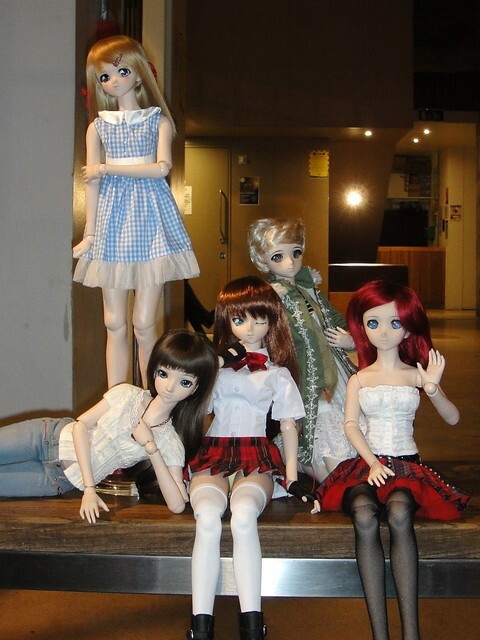 *sigh* Despite the lack of pictures, we had a lovely evening – and the DD girls in attendance were GabrielVH’s Moe, my Annalise (DD Rise Kujikawa), Jezatron’s Ryomou, JRuzzy’s Haruka Niimi and Pink_Blaise’s Inari (DD Neris). I had a minor fashion emergency when I unpacked Annalise at the hotel – I had transported her in 2 pieces so that she would fit in my carry-on suitcase and somehow when I switched luggage her skirt got left behind at home! >__<” Luckily fransgaard came to the rescue by bringing a cute pair of Mai Little Alien jeans for her to wear. They are so much more stylish than my backup plan of crafting her a sarong with a bar napkin!